In this post, learn how to save water without sacrificing the beauty of your property with these low-water, drought-tolerant landscaping ideas. For other home and landscape design ideas, please visit our portfolio. Why Is Drought-Tolerant Landscaping a Good Idea? California’s new water restrictions carry hefty fines to help encourage households and businesses to curb water-wasting actions like watering plants and lawns during the day, washing your car, or even watering down your sidewalk or driveway. With this continued drought, landscapes and lawns that used to be green and lush are all turning brown—and not just in the summertime anymore! What About My Beautiful Lawn? The phrases “zero-scape” or “drought-tolerant landscaping” may bring to mind a dry, dusty, and dull landscape of sand and rock. We’re pleased to inform you this is simply a common misconception! Below, you will find practical drought-tolerant landscaping ideas that are not only water-wise but increase the curb-appeal of your home. Learn more about each of these drought-tolerant landscape design techniques below. Xeriscaping, also known as “zeroscaping,” is a technique for landscaping in which use of water, energy, and chemical fertilizers is reduced as much as possible. Save water without sacrificing beauty by using drought-tolerant succulents like Panda, Medicine, Jade, and Snake plants, as well as California native plants like the Desert Willow and the California Fuchsia. Native plants are a staple for a San Diego xeriscape design company like us because they need very little care as they are already acclimated to San Diego’s climate. Contact us today for softscape services in San Diego! If you really want to eliminate landscaping water usage, you can use hardscaping to transform your backyard into a luxurious outdoor entertainment area. There are water incentives available in San Diego for home and business owners. Replacing your stretch of brown grass with an extended patio, entertainment area, outdoor kitchen or pool is a great solution. Hardscape yards make space for activities, require less maintenance, and overall use fewer resources while still looking good. While not always the best backyard option for homes with young children, hardscape design in San Diego makes for a nice, clean, and organized look that can’t always be accomplished with plants. 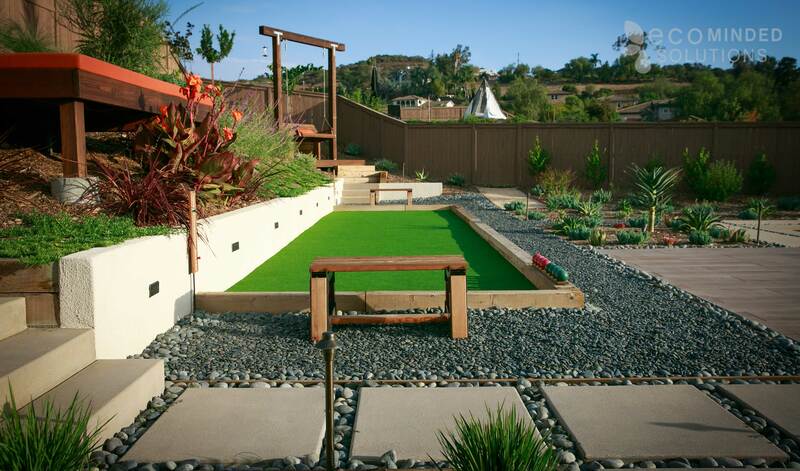 Since our founding in 2007, Eco Minded Solutions has been a leader in designing and building drought-resistant landscapes for homes looking to replace their lawns throughout San Diego County. There are many alternatives to just accepting parched grass, bare dirt or gravel, or paying for expensive water (and risking fines for illegal overuse of water). Why not sell that lawn mower and invest in a new surfboard? Still Not Ready to Give Up Your Lawn? If you need a lawn for children to play in, or you just aren’t ready to let go of your green oasis, one way to reduce your water usage while keeping a lawn is to install underground irrigation, which is not covered by San Diego’s restriction on overhead watering. We recommend this updated irrigation be installed at the same time the high water-use grass species is swapped out for a more water-wise grass or fescue. Smart irrigation systems help you save water through clever and efficient water distribution. Some of these low-water irrigation systems use drip irrigation, which can significantly reduce the risk of flooding your plants as well as reduce wasted water due to evaporation. Coupled with instruments that can sense how sunny or wet it is, these systems help your landscape resist the drought with less maintenance and can even be set to auto adjust based on the weather so your plants receive the water they need, when they need it. Time to Upgrade Your Landscaping Lifestyle! 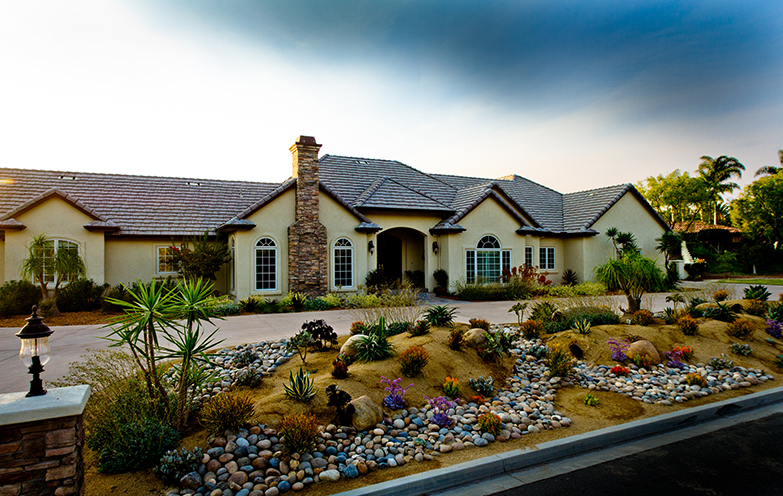 Given the recent news about water restrictions in California, we hope our drought-tolerant landscape designs have inspired you to transform your home and have shown you that you can save water without sacrificing the beauty of your property. Contact us today for a free design consultation!